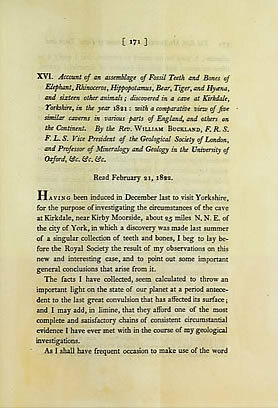 "Account of an Assemblage of Fossil Teeth and Bones of Elephant, Rhinoceros, Hippopotamus, Bear, Tiger, and Hyaena, and Sixteen Other Animals; Discovered in a Cave at Kirkdale, Yorkshire, in the Year 1821: With a Comparative View of Five Similar Caverns in Various Parts of England, and Others on the Continent." Philosophical Transactions of the Royal Society of London. 1822. 112: 171-236. Through discoveries such as this, Buckland is credited with establishing paleontology as a discipline. He began scientific investigation of fossils and bones unearthed in digs, seeking to contextualize them. This article contains numerous engravings of fossils, as well as a drawing of the caverns in which they were discovered. Buckland's ideas represented a significant departure from the conventional scripture-based philosophy of his day.